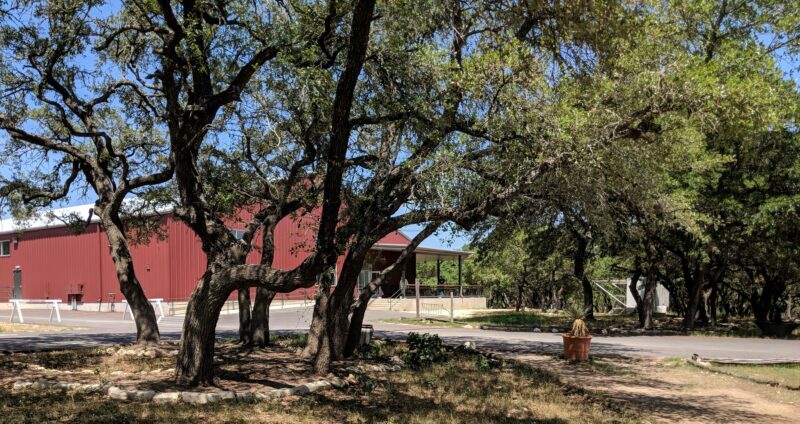 A few weeks ago we sat down with Gino Graul, the manager and co-owner of Family Business Beer Company in Dripping Springs, Texas. After he got me a few delicious tasters, we hung out in the warehouse area, where the brewing actually takes place. The heat was sweltering, but the drinks were frosty as we chatted about Gino’s favorite subject – beer. Nerds and Beyond: Tell me a little bit about the summer beers – I know last time I was out here you guys didn’t have Summer Spree and the Westie, those are fairly new. Gino Graul: Did we have the Aurora, the Vienna Lager? Gino Graul: We were so upset that one left. The difficulty is that we’ve got 12 taps, so we fill those up pretty quick. Our whole business model is something new, mobile and variety, so we are always going to have some new beers that are seasonal releases, and season appropriate. The Vienna Lager was the first kind of summer beer that we started off with. We did the Aurora followed by the Americanas, and the German Helles. We also did the Spree which is just a Berliner Weisse, low ABV, kinda tart, very refreshing, kind of a patio pounder, and then a variation on that (The Summer Spree). We enjoy doing kettle sours, and we did those on our pilots system as well. I think we brewed somewhere around 75 batches on the pilot system. We kind of went through at least a full season and a half in Texas. These beers are definitely geared towards summer and the warmer weather. Nerds and Beyond: I didn’t get a chance to look at the ABV (alcohol by volume) on the new beers before we started – are they low across the board? Gino Graul: Yeah. The Berliner, and the Sprees are mid 3%. Nerds and Beyond: Especially when it’s hot, and people are sweating and it’s a windy road to get out here – seems like a good idea to have low ABV. Gino Graul: We wanted to make sure that our beers were more sociable, and not one of those situations where you come in, you have one beer, an Imperial IPA (higher ABV), and now you are drunk. That’s not really the vibe that we have out here. It’s more like, come into contact with the brand, enjoy the product and find something that you like – which is why we offer flights. We actually switched our license from a manufacturing facility to a brewpub so we can offer beer to go. Unfortunately, Texas is the last of all 50 states to allow manufacturing facilities to sell beer on site. Which means you have to go to manufacturing facilities and essentially drink all you can because you can’t buy a six pack or a growler. We want it to be an enjoyable environment for people to come out and we don’t want people to feel obligated to drink. Try a flight, find something that you enjoy, drink a beer or two, hang out, and we’ve got the playground for kids. We’re about to launch a little snow cone stand with 22 flavors. Nerds and Beyond: Oh that’s exciting. Is Jep going to run it (Jep & Jessica Roberts run “Jep’s Southern Roots” a southern inspired food truck onsite) or will it be FBBC? Gino Graul: Kind of a collaboration. We basically provide everything but his kids are adamant that they want to work in snowball stand. Nerds and Beyond: How old are they? Gino Graul: I think they’re in the 16 year old age range, I think it’s kinda perfect. We’ve got a supersized window unit in there so it’s like freezing cold. It was an idea that we had a long time ago but I have to keep reminding myself we’ve only opened 5 months ago, because I’m like…we’ve got to have all this done! But it’s kind of been pedal to the metal. It’s something that we have wanted to incorporate sooner than later. The whole concept is that we are this brewery that you can bring the kids, they’ve got a snowball stand and they’ve got a huge fenced in playground that they can play in. Keep them entertained without an iPad or phone or anything like that. They can enjoy the hill country out here, and then the food trucks. The food is taken care of, the entertainment is taken care of. We are starting to do live music on Friday nights. Nerds and Beyond: A lot of breweries, as I’m sure you know, do collaborations between one another. I know Stone has done a lot of collaboration between breweries. Is that something you guys are thinking of doing with local breweries here? Gino Graul: We’ve talked to some of our friends at a couple of other breweries and just kind of spit balled the idea. Brewers are always looking to collaborate and do something fun. What my head brewer Nate was trying to get away from, was that if you’re distributing sometimes you can kind of get stuck, so you’re just basically doing the same recipes over and over and that’s not really that fun. We’ve got seven staples that we do here that will be on indefinitely unless something crazy would change it. But, you also want to have rotating beers that are seasonal or one-offs or something exciting. Sadly, at the Craft Brewers Conference in Nashville it took the CBC to get all the Texas brewers together in one room. We do brewer’s nights one Monday a month. I think we will have to sign up to host here next year. Nerds and Beyond: I did see that you guys attended a craft brewers night recently…in the last couple of weeks. Tell me about it. Gino Graul: The last one was at Black Star, I think. The one before that was Oscar Blues. Mondays are like my only night off, I also recently got married. That’s one of two nights off that’s supposed to be a date night. She’s not a big beer drinker. You know it’s crazy – I was planning a ying-yang kind of thing. I’m the beer drinker and she’s the designated driver. I’m trying to talk her into going to Brewer’s night. She may take one for the team but pick a brewer that’s got sour beers because she likes sours. Nerds and Beyond: That was my intro into beer too, that and sweet stouts. I’m starting to kind of branch more and more into lagers, and things like that. My question though is actually around that. If you’re going to set somebody up – somebody who comes out and they’ve got no experience with beer – what do you start them with here? How do you suggest they start to fall in love with beer? Gino Graul: That does happen a good bit. I think what we’ve kind of done as a staff is pick some favorites. There’s like 20 people in line and they all say ‘so, I’ve never had a beer in my life’. Our staff are super excited and knowledgeable and they just want to launch into ‘What you’ve got is your four main ingredients…’ So it can be a little time consuming. I think for most people that don’t really like beers, very aggressive hopped beers can be an acquired taste. It’s kind of the same thing with my wife. I know don’t give her an IPA cause she’s not going to like it, but let her take a little sip. She [always] says ‘ew, oh my god, it tastes like…’ whatever. She always comes up with some kind of colorful term for it. But yes, starting off with the Sprees or the Koelsch – that would be really good because it’s very light and balanced. Nerds and Beyond: So just in general lighter beers I suppose? Gino Graul: Or the multi-tier beers like the King Biscuit ESB. You know we always have to tell them – they say ‘what’s ESB?’. It’s actually Extra Special Bitter but don’t think that it’s bitter – anybody hears bitter if they’re not familiar with the beer says, “yeah, I don’t want that.” It’s a very malty beer. So the King Biscuit is a good go-to for new beer drinkers and also the Oatmeal Brown Ale (The Hall & Oates). Nerds and Beyond: You know I was surprised that I really enjoyed that. I mean not like an insult in any way but generally speaking not a type of beer that I would enjoy. Gino Graul: I’ve never really been a big fan of brown ales but I don’t think I’ve found one that I don’t enjoy. The ones that I’ve had they were brown but only in color. There really wasn’t a lot of complexity with the flavor with them either. Then Nate made the Oatmeal Brown Ale and it’s just so complex and it’s got all the wonderful flavors, kind of like an Oatmeal cookie sweetness to it. Nerds and Beyond: All right, I’m going to switch gears a little bit. I want to talk about some of the experiences that you’ve had since you said you’ve been open about six months. Obviously you know where I’m coming from – the Nerds and Beyond audience is comprised mostly of fans. Have you had any like crazy fan experiences? Gino Graul: I’ll say 99.9% are fantastic people. They are genuine people. We understand that for a lot of them, like you said, it is kind of a pilgrimage. People drive in from all over. We want to make sure that they realize that they are appreciated. For what gets them here we’re very thankful, and we want to make sure that they have a great experience. That also, from the beer side, gives us an opportunity to turn somebody on to craft beer that may not have been a beer drinker. Most of the reviews that we’ve got online from people that come out on a pilgrimage say ‘I was just blown away by the quality of the beer’. So that that’s really what we’re going for. We’ve been able to advertise on a platform that most breweries don’t have. You know again, very thankful that we had that opportunity. 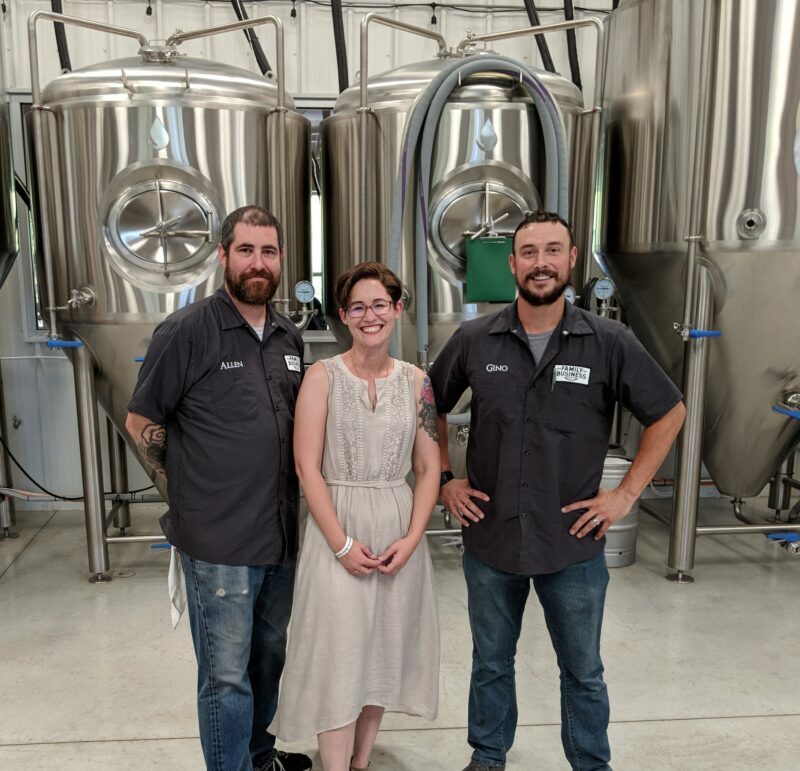 I also feel a sense of responsibility to make sure that we represent Texas craft beer in the right way, and that we also can allow the brewery to stand on its own merit and the quality of the beer. For the brewery, that’s that’s the most important thing is that we’re recognized for making quality product. And you know, yes we do have a notable owner. Nerds and Beyond: I was just going to ask you… I mean obviously it’s a family business. There’s a lot of family involved. I know your parents are involved too. I’m really close with my brother and I was thinking how it would be kind of cool to run a business with my sibling. What’s it like working with your sister? Gino Graul: It’s great. Honestly, we’ve always had a really good relationship. I think since we started this business, even the business idea in 2010, somewhere around there, it’s definitely strengthened our relationship. I think it honestly could go either way sometimes, personalities can kind of clash. But she’s super creative and so we lean on her heavily for design ideas. Nerds and Beyond: Her sense of style is really incredible. 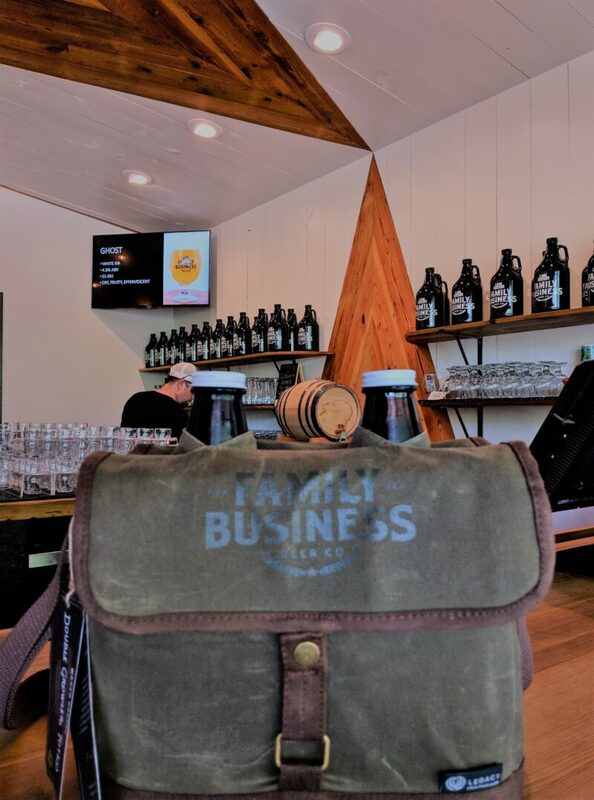 FBBC Growler Carrier, now on sale at the brewery! Gino Graul: It really is. So sometimes she’s like, “well I’m decking out the tasting room, it’s my baby.” I’m like OK that’s fine – from the tap handles back, that is my domain. We’re not going to have any crossover and so she handled the build out and got all the artists together. Adam Young built the bar with 110-year-old long leaf pine reclaimed from a school in West Texas. She definitely put a lot of love and time into making sure it was exactly what we wanted to present when people come in, kind of a wow factor in a way. You come in, you’re like, wow, this is not just a dingy old brewery in the standard warehouse district or something like that. Nerds and Beyond: That’s 90% of breweries. Gino Graul: Nothing wrong with that because I’ve had some of the best beers of my life in those places and I still go there. But we wanted to be a little different and have a location that’s more representative of who we are – we’re craftsman. Nerds and Beyond: I want to talk about the future – I know you guys talked about maybe having some taps in town but not a big thing. Maybe doing something here as far as a wedding venue? What are your plans? Gino Graul: Maybe an event center or an event space. Gosh, I can only imagine doing a wedding here, I would lean heavily on Danneel to make sure that that was exactly what she wanted because her sense of style is amazing. We definitely want to have an event space out here, I think it would be perfect for it. We still haven’t even started to tackle permitting and all that kind of stuff. We’re in an environmentally sensitive area which works out for us because we love this land and we’re willing to go through whatever red tape or whatever we need to do to make it happen. We truck all of our water in and all of our production wastewater out. We’ve got a very small septic system that just handles the waste from restrooms and every other drop of water is trucked out of here. It’s not a cheap way of doing things but we were in love with the land and we wanted to be here. So we are willing to basically do what it takes. As far as distribution out in town, Nate and I are very OCD with our quality control. We want to first off make sure that we’ve got enough beer to supply our tasting room and if there’s any leftover after we brew we can make our projections on what we need before we need to brew again. If there’s 10 kegs of something left over we’d go around town and find a couple places that we know handle beer well. We want to make sure that we put our product in places where they appreciate craft beer and then they also know how to sell them as well. Nerds and Beyond: I would suspect that there’s a lot of places here in Austin. Gino Graul: I think the demographic in Austin appreciates craft beer, especially local. That was something that we adored the second we got here. It’s like people really enjoy craft beer and they want something that’s local. That that kind of worked out with our business model. You know we want people to come out here and enjoy the space that we built. Nerds and Beyond: Is there anything else you want to add. What are people not asking about? What do you want to put out there? Gino Graul: Good question. I think a lot of questions we get online is on distribution. ‘I’m in France, where can I find your beer?’ I don’t think they realize we’ve got a very small system. Our 15 barrel system is perfect for a brew pub but we wouldn’t really be able to canvas even half of Austin if we wanted to. So I was trying to advocate – road trip. Come on down and visit and you can get beers to go. I’m hoping within a year we’ll start canning and be able to sell it to go. It’s always a pleasure to have a beer at my favorite brewery, even if its quite a trip for this California gal. Thank you to Gino for taking the time to talk with us. 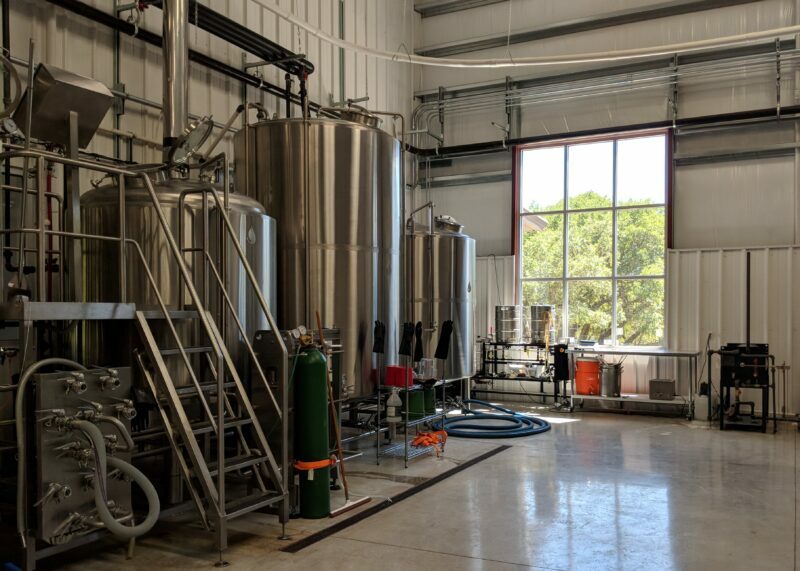 Have you made a trip out to Family Business Beer Company yet, or are planning to? Tell us your plans in the comments below! Next story Jensen Ackles Takes Over the Forbes Instagram!